We are thrilled to announce that Doyali Islam is the winner of the League of Canadian Poets’ inaugural National Broadsheet Contest! Her winning poem “cat and door” was selected by judge Sharon Thesen for its “sweet formalities of elegiac thought.” Islam was the winner of Arc’s 2016 Poem of the Year contest and CV2’s 2015 Young Buck Poetry Prize, as well as the recipient of a 2015 Chalmers Arts Fellowship. 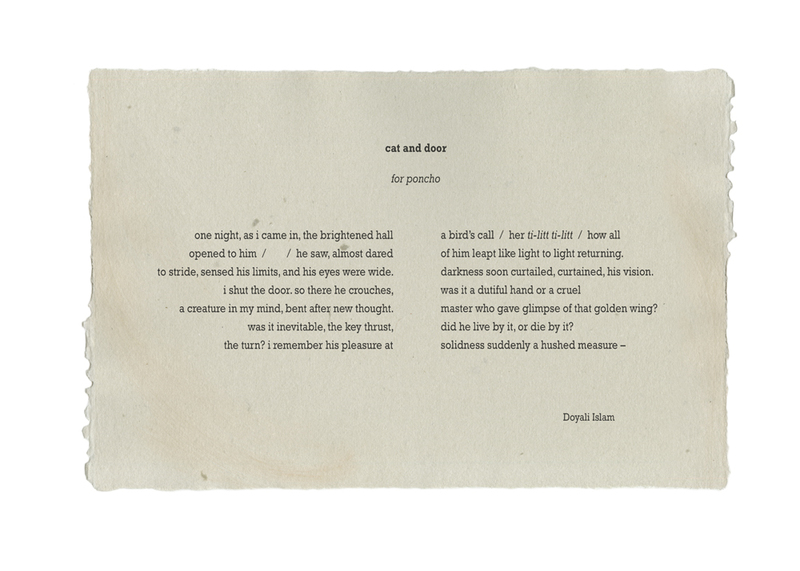 In addition to being crafted into an artisan broadsheet by Briar Craig (read more about Briar’s creative process here), “cat and door” will be published in the 2017 booklet for Poem in Your Pocket Day on April 27, as well as featured here on our website! Thesen also selected two honourable mention poems: “Sheila’s Brush” by Maggie Burton, which she calls a “lively poem of protest and revenge,” and “Trilobite” by Joanna Lilley for its effective and poignant presentation of form and content. Doyali Islam’s second poetry book is heft (McClelland & Stewart, 2019). Poems from this collection can be found in Kenyon Review Online and the 2018 edition of The Best Canadian Poetry in English. In 2017, Doyali was a National Magazine Award poetry finalist and a guest on CBC Radio’s The Sunday Edition.